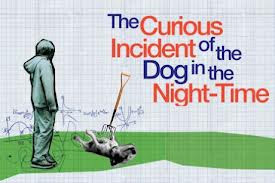 In this blog we can discuss the form and content of Mark Haddon's novel from 2003. Hopefully, we will have many creative an interesting discussions on our way towards a better understanding of the book. Your personal opinions are very welcome here, but remember to be relevant and argue your points in an adult and proper manner. As a rule I (JT) will post questions and statements for you to answer and reflect upon, but you may also start your own discussions. If you do, remember to be relevant and serious. In chapter 47, Christopher explains the system he uses to determine wheter a day is a Good Day, a Quite Good Day, a Super Good Day or a Black Day. Which criteria do you have for determening if a day is Good or Bad? Perhaps you have your own "name" for a type of day? If i feel awake and energized, I typically believe it's going to be a good day. However, if I wake up tired and maybe have a little headache, I believe it will be a bad day. I agree, how I sleep and the feeling right after I wake up, have some influence on my mood and the rest of the day. I totally agree! If I sleep badly I am most likely tired the next day, and I'm not exactly little miss sunshine when what I really want to do is go to sleep. However, if I wake up with plenty of time for my morning routines and the possibility of coming early to school I normally have a great day. It is also a good day if I know I don't have so much homework that I can spare time to go skiing. Especially when the conditions are good. When I'm going to bed the evening before, I can imagine if there will be a god or a bad day the next morning. Monday, Thursday and Friday, are often good days, considering that the school ends earlier, and also which subjects we have that day. If there is nothing particular I should have done by the end of the day (with schoolwork in my mind), there will automatic be a much better day. If I have do have much to do, it will hang over me like a grey cloud, and "colouring" my mood. Aka a bad day. Every day in the weekend is a good day, (unless we have a test, or something else within school). But in the end, almost every day doesn't turn out quite like I have expected, and most of the days turns out to be great! If I oversleep and can't find anything to wear, I know this will be a bad day. It also ruins my day by missing the bus or if it's raining and blowing. On the other siden, there will be a great day if I wake up to sunshine and a blue sky. So the weather can definitely affect my mood. Also on this topic I have to agree on the arguments over. My degree of tiredness, how much work i have to do, the weather, everything is important factors of how my day will work out. I also have to add one thing; how people talk and behave when they are near me. If someone are not nice in their way of talking to me, or doing something to irritate me (especially if they know it), my day will more or less be ruined. It`s hard to tell if a day is good or bad. I think everything that happens has an influence on the fact if a day is good or bad. Whether it`s a good or a bad day. An example:If the rain is pouring outside, and the sky is dark, it will give me a "bad day feeling". I can really recognize myself in the breakfast-part you're writing about! I don't have any special criteria for whether the day will be a good or a bad day, but when I wake up, I can feel it. Factors like the weather, the way I feel, and what my program for the day is, are of great relevance. In addition to this, which day it is has an impact on my mood. I'm far more motivated to get up and go to school on Fridays, rather than on Mondays. My criteria’s for a good day is that the weather has to be good, that I don’t feel tired or sick, that nobody is angry without any reason in the morning or it can be as simple as that i feel good that particular day. For it to be a bad day almost every single thing that is supposed to make it a good day goes wrong. Then it is a bad day and i like calling it a "bad day":D other things that can and most certainly will make it a bad day is Mondays. A good day for me, is a day where nothing bad happens. If something bad happens, or I do something really stupid the day falls into the bad zone. For me, the weather does not matter that much to how good or bad the day was or is. Often, when a day is neither good or bad, what we have for dinner is the deciding factor that determines wether it is a good or a bad day. Although if absolutely nothing happens, it is a very bad day. I can feel if it's going to be a good or bad day during the first sixty minutes after I've waked up. Nothing is a worse start of the day than stress. Unfortunately, a lot of this stress is something I can't prevent. If I have a bad hairday, or even worse - a bad makeup-day, something extraordinary has got to happen to make the day a good one. If I feel well, the day often turn out great. A bad day for me is a day when everything goes wrong and nothing is like it is suppose to be, for instance I get late for the bus or have a test that I haven't prepared for. I can also be that I haven't got my beauty sleep, because if I don't get that I get very grumpy and mad. A good day on the other hand is a day where I have got my beauty sleep and it's a day where the sun shines and the birds are singing. If a day would be good or bad for me depends of how much I have slept during the night and how the rest of the day seems to be. When a day is full of much stress and homework, it isn’t the days when it’s most tempting to get up from bed. A good day is when I have slept well and I could do just what I want for the rest of the day, without any boring things I have to do. Usual, when I go to the bed, I would think about the next day and I can also almost decide if the next day could be good or bad if I know what I’m supposed to do. My criteria for a good day would be that I didn't oversleep, and that I don't have a lot of stress in the morning. If I like the subjects we have at school that day, or I know we are doing something fun, I will have a good day. A bad day would be if I oversleep and my hair just doesn't just look right. Nothing seems right, and breakfast doesn't taste any good. School is booring and I just can't wait for the day to end. If I oversleep, and would have to rush to school, it is most likely to be a bad day. This is because I'll get very stressed, and I won't have time to put on my makeup or to brush my hair. Also if I have no food, or no money while being hungry, it sure will be the worst day ever. However, a good day would be if I woke up with the sun shining through my window, knowing that I have no plans for the day. As many of my fellow students, i don't have any special criteria for whether the day will be good or bad. But if I haven't got enought sleep, or i haven't studied enought to the upcoming test, it will automatically become a bad day. A good day would be knowing that I don't have much homework to do, and if I at the same time have something to look forward too, it will be a super good day. I don't have any special criteria for whether the day is good or bad, either. Not enough sleep, noisy classmates and grumpy teachers can make my day bad though, and whether or not I get a satisfying grade or not. I usually don't start with a bad day, anyway. Thank God. I have to agree with you here, Gina. Noisy classmates can actually ruin your concentration and make it a "black day". In a good day I manage to catch the bus to school, hopefully with a cup of coffee in my hand. I would also have time to put on my makeup in the morning. If the day is very good i might even have time to eat breakfast before i leave from home, It would also be some free seats at the bus so I can sit. In the bus on the way to school the next day Christopher sees 4 red cars in a row 'which meant that it was a Good Day. The psychologist at school had told him it wasn't very logical to think like this but Christopher argued that he likes things to be in a nice order and that people who work in offices are often happy when the sun is shining in the morning and sad when it is raining, even though the weather doesn't really affect them while they are sitting in an office. Christopher tells the psychologist that he would like to be an astronaut even though it was very difficult to become one. Terry at school tells him he will only get a job in the supermarket or at an animal sanctuary but his father tells him that Terry is only jealous. Christopher says that he is going to go to university and study maths or physics or maths and physics. On this good day, Christopher decides to try and find out who killed Wellington. Siobhan tells him that they're meant to be writing stories today and that is when Christopher starts writing his book. And no. I do not have my own "name" for a type of day. But that can be arranged. I don’t have any criteria for whether a day is a good or a bad day. It depends on the day… There are many things that can make my day good or bad. A good day means a lot of sleep, good food, that I am not surrounded by annoying noisy people and hot weather of curse. A bad day (I have most of those) means no sleep, cold weather, nasty smells and an empty wallet. It is also quite annoying then I can’t find something to wear or all my favourite clothes are in the laundry. I don’t have special criterion or “names” for types of days, but I do (like everyone else) have better and worse days. If I wake up without having a cold and feel happy and well rested, it is at least a good start of the day! The teachers at school also determine a great deal of whether I can have a nice day or not. If the teachers are in a bad mood, they also make thirty students getting in the same mood. I think that teachers should be able to come into a classroom without having a terrible attitude, even though they maybe had a bad start of their day themselves! I don't have any special criteria for whether the day is good or bad, either. A bad day can often start with some stress in the morning, or with some bad weather. If it’s raining when I walk to the bus, the whole day could be ruined. Sitting wet and cold on a long day of school, is not especially pleasing. Many small pleasant little things, makes my day fantasic. A shining sun and a greeting bus driver could be enough! Who has your sympathy in the end? Topic 9: What should literature be?